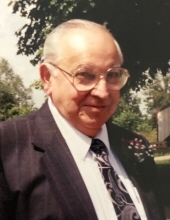 Donald Eugene Faulkner, 89, was welcomed into heaven by his loving Savior, January 21, 2019. June 14, 1953. While engaged to Barbara, he dutifully served over seas as a Marine in the Korean War. Together, they raised two sons, ran a local business and family farm, and enjoyed 65 years of marriage. Don’s three loves included the Lord, his family and people. Don never met a stranger and went out of his way to form a connection with everyone he met. Because of his outgoing personality and caring spirit, many were lucky to call him friend. His family was his pride and joy. He loved them well, a constant presence during every season of their lives. He and Barbara faithfully prayed for each son, daughter-in-law, grandchild, and great-grandchildren by name every day. He loved to make Barbara smile through his constant jokes and playful antics. They enjoyed life together traveling, loving their family, visiting with friends, and serving their church and community. Don’s life was centered around his relationship with Jesus Christ. He was routinely found with his Bible open devouring the scriptures. He was a faithful member of the United Pentecostal Church of Bourbon where he served in multiple capacities. He is survived and will be greatly missed by his wife, Barbara E. Faulkner, Bourbon; his two sons and daughter-in-laws, John and Martha Faulkner, Bourbon and Ron and Jo Faulkner, Warsaw; His seven grandchildren and grand-spouses, Joel and Justina Faulkner, (Bourbon), Erin and Chad Kuntz, (Bourbon), Jared and Ashley Faulkner, (Bourbon), Angie and Doyle Wood, (Warsaw), Emily and Justin Grubbs, (Bremen), Ryan and Theresa Faulkner, (Warsaw), Adam and Sarah Faulkner, Fort Wayne); 17 great-grandchildren: Carter, Tessa, Jaela, Taten, Jocelyn, Damon, Danica, Brynn, Tassara, Addy, Keegan, Ayva, Eliana, Macy, Jackson, Avery, and Jameson; additional survivors include a sister, Joan Weissert, (Bourbon) and a brother, Tom and Norma Faulkner, Bradenton, Florida. He was preceded in transition to Heaven by his parents, Carl and Hilda Faulkner and sister Betty Faulkner. The family will receive friends for a time of visitation from 1:00 - 3:00 PM on Friday, January 25th at United Pentecostal Church of Bourbon. A service to celebrates Don’s life will be held immediately following the visitation with Pastor Mark Cottrill officiating. Military burial rites will follow the funeral services and burial will take place in Pleasant Hill Cemetery, Bourbon. The family requests memorial contributions be made to his church (United Pentecostal Church of Bourbon). The Deaton-Clemens Funeral Home is honored to be entrusted with the arrangements for the Faulkner family. To send flowers or a remembrance gift to the family of Donald E. Faulkner, please visit our Tribute Store. "Email Address" would like to share the life celebration of Donald E. Faulkner. Click on the "link" to go to share a favorite memory or leave a condolence message for the family.